My spell checker tells me I have two suspicious words in the title. It has not heard of turpentining or a catface. Many of the readers can probably figure out what the former means, but I bet they don’t know what the latter is. There are lots of festivals across the country which provide a travel adventure immersed in local history and folk culture. 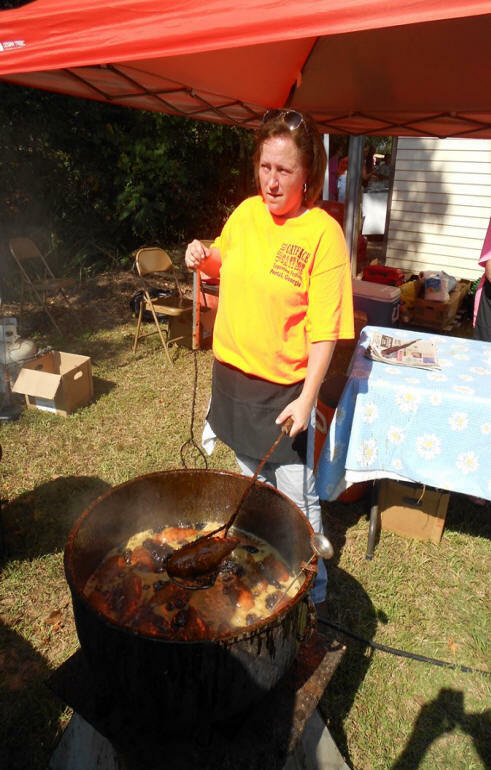 The CatfaceTurpentine Festival held annually in early October in Portal, Georgia is one of those. The 37th one was held this year, so the folks of Portal have some experience putting on this festival. It’s a standard rural festival, starting with a parade that includes every local vehicle with a siren and, of course, Miss Turpentine, arts and crafts, a cake walk, all kinds of unhealthy food, children’s rides and games, live entertainment, ending with a street dance. 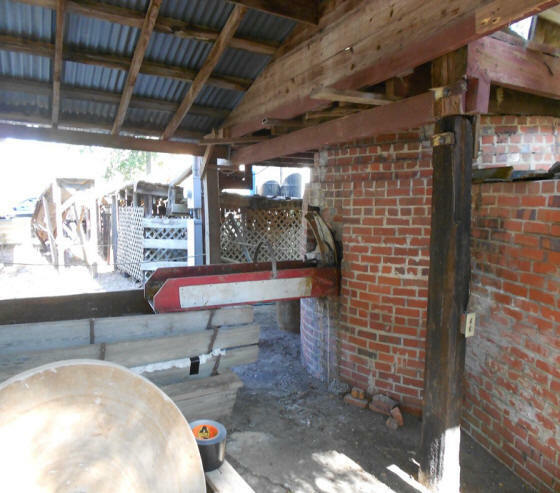 This one is different because it embraces the local history of a fascinating industry and has an operating turpentine still as the center attraction. The festival begins with a typical small-town parade. 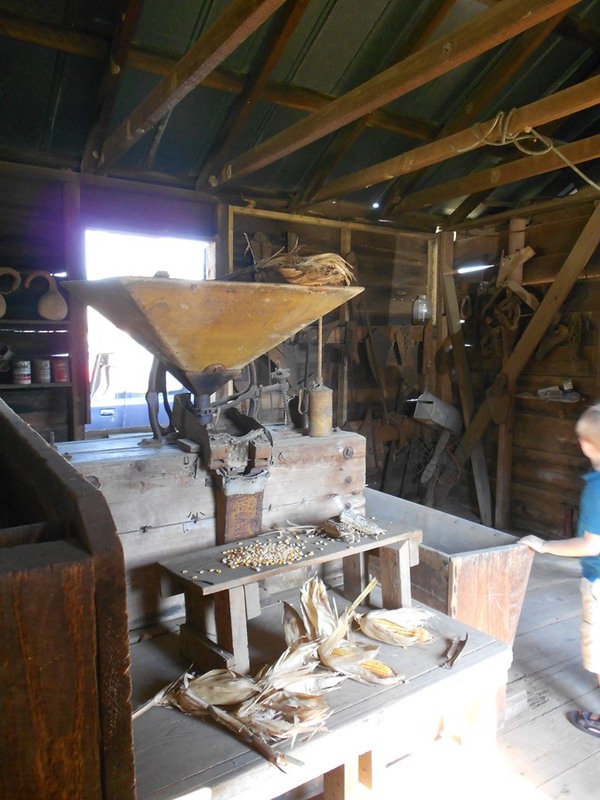 Carter’s General Store has a museum out back that includes a grist mill. First, some brief history and technical detail. Turpentine is a product of the naval stores industry. Naval stores was one of North America’s first industries and involved utilization of southern pines for their resinous sap. As early as 1608 Virginia producers were sending pitch and tar from pine trees to England. The term “naval stores” comes from the use of pitch and tar for waterproofing ship hulls and decks and for preserving ship’s rigging. Even after its use for naval purposes diminished, the term persisted to describe the industry. Turpentining refers to collecting crude gum from “tapped” living pine trees by removing a portion of the bark, causing the tree to secrete gum that is collected and distilled into spirits of turpentine and rosin. That living tree was usually the resinous longleaf pine, sometimes slash pine, causing the industry to be located near the southern coast ranging from Virginia to Texas. 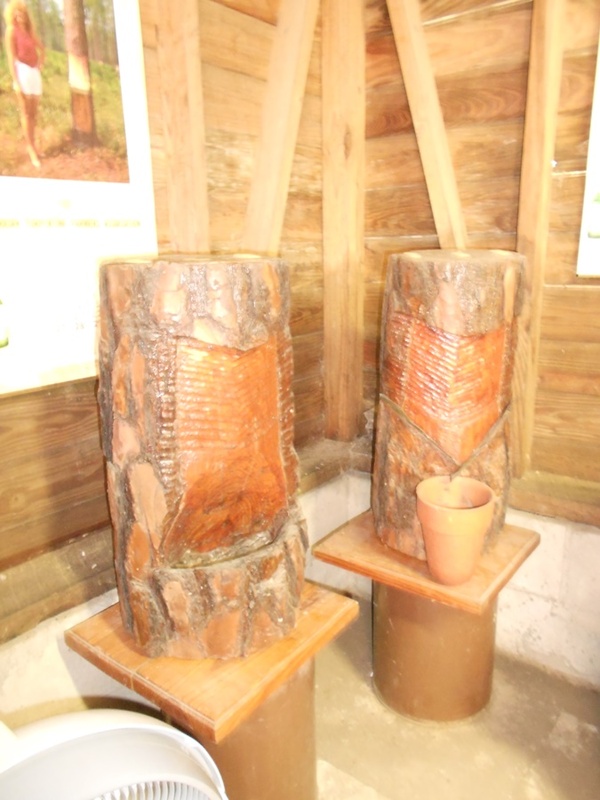 The process began with “boxing” the trees by using long-headed axes to cut an elliptical hole, roughly eight to twelve inches wide and four to five inches deep at the base of the tree trunk. This formed a cavity used to collect the resin. Next, the box was “cornered” by removing bark in a triangular pattern on each side of the top of the box. These slash marks resembled whiskers on a cat’s face, creating the term “catface” for the wound on the tree. The tree naturally secreted sap or gum as protection from insects and disease due to the wound. About every ten days the turpentiner returned and cut a new streak on the catface with a tool called a hack -- called “chipping.” At the same time resin was dipped from the boxes and collected in barrels strategically located in the forest for later transport to a distillery. A turpentiner would chip and dip a “crop” of 10,000 catfaces in a season (from April to October) with a yield of 150 barrels of gum turpentine. The process was labor-intensive and would eventually kill the trees. As forests were depleted turpentiners would have to move to new regions of the South. Examples of catfaces from the Turpentine Museum. 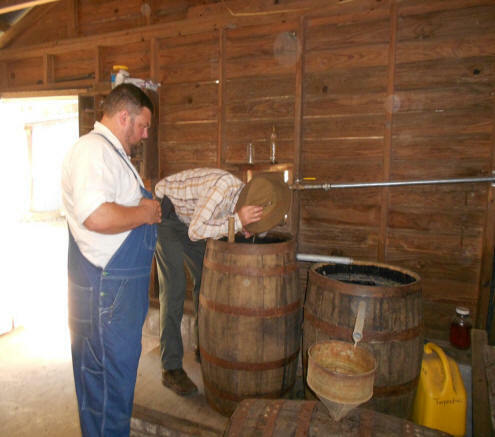 At the distillery the gum was transformed into turpentine and rosin. The gum was loaded from the barrels into the still, mixed with a small amount of water, and heated in a copper still until the mixture began to boil (similar to a whiskey distillery). Vapor would flow through tubing (a copper worm) where it was cooled by water, would condense, and be dripped into a collection barrel as spirits of turpentine. The mixture would contain both water and turpentine, and laborers would skim turpentine from the surface. This was called gum turpentining. Rosin would congeal at the bottom of the still and a tap would allow it to flow into a trough for collection. The master distiller knew when to add more water or increase the heat from sounds made by the worm or the boiling gum. The process took from four to six hours and shown in all its glory at the festival. The entire still from the ground. 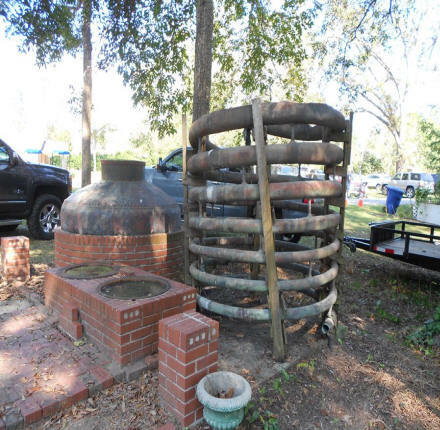 The turpentine industry in Bulloch County's town of Portal began with F.N. Carter, Sr., and his son E. C. Carter, who owned and operated a commercial turpentine still from the 1930's until the 1960's. Then, for nearly 20 years, the Carter still was cold and silent. While many stills from that period were dismantled and parts were sold for the copper tubing and iron boilers, the Carter Still remained as it was and on its original site. 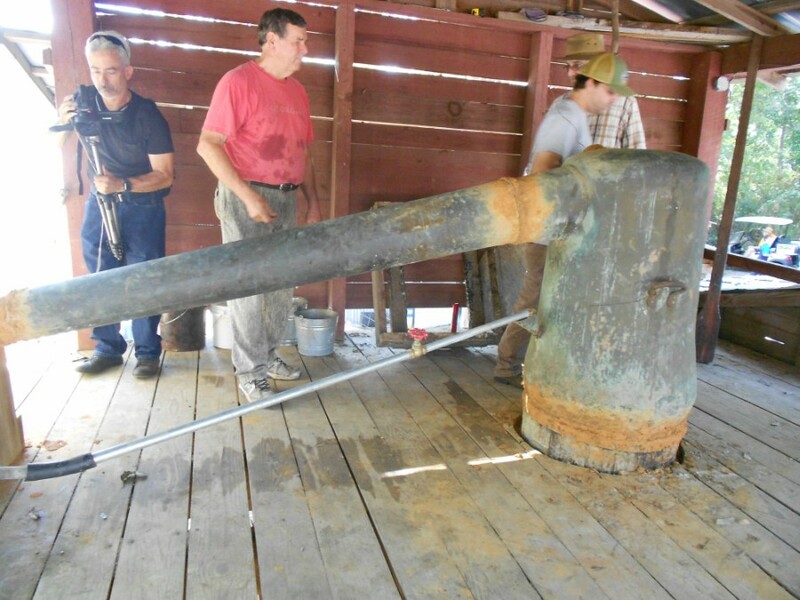 IIn 1982, Denver Hollingsworth and the Portal Heritage Society suggested restoring the old Carter turpentine still; and with much work and dedication from the community, the old still was restored and, once again, the old boiler was lit. The Carter turpentine still is only one of three turpentine stills remaining in the State of Georgia. The two other remaining stills are located in Tifton and Walthourville. The turpentine process begins with harvesting pine tar/gum from "Slash Pine" trees. Turpentine harvesters cut slash marks into the sides of pine trees, and the tar/gum slowly leaks into metal vats placed at the bottom of the slash marks. The slash marks resemble whiskers on a cat's face, thus the term "Catface Country" was adopted for Portal's annual Turpentine Festival. After collection of the pine tar is completed, it is "cooked down" at the still to result in turpentine. Apparently quality can be judged by the smell. An example of the type of tubing used in the still. The parade is led (loudly) by lots of emergency vehicles, followed by bands, many Miss Turpentine Queens, very local celebrities, and a float or two. Across from where we watched the parade was Carter’s General Store. It turned out to be more of an antique store, but outback was an interesting small museum with farming and turpentine items (including an example of a catface to get things going). 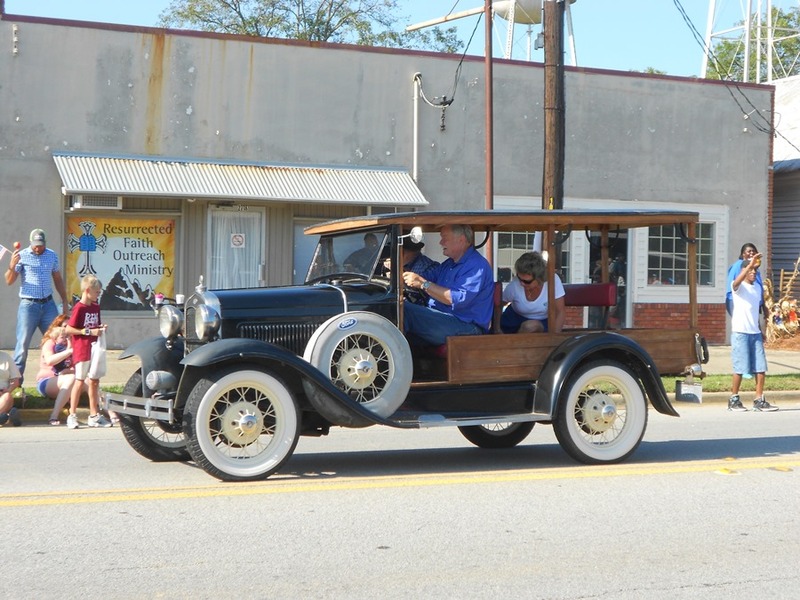 It’s a small town and the parade route is walking distance to the festival grounds. The festival includes all the food, entertainment, arts and crafts, and children’s attractions you’d expect at a local event like this. The truly different part is the turpentine stuff: the still, turpentine museum, and the rosin potatoes. We’ll start with the potatoes, as it is kind of fascinating to think of cooking a potato in boiling pine rosin. It must have been a desperate forest worker who first tried it, but supposedly the rosin distributes the heat exceptionally well around the potato producing a truly delicious treat. The potatoes (both regular ones and sweet potatoes) are boiled in rosin heated to 350 degrees and cooked for an hour. You can’t eat the skin with this cooking method due to the rosin, but the potatoes come out tasting fine. both sweet potatoes and regular ones are sold. 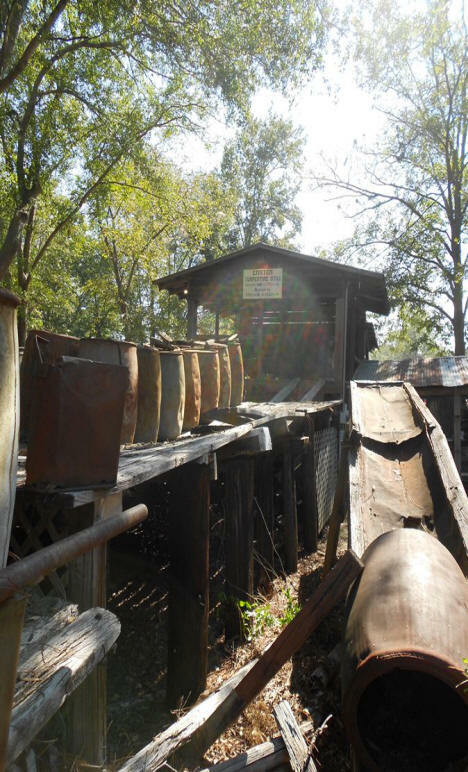 The Carter Turpentine Still with barrels. Saving the best for last, that would be the Carter Turpentine Still and the adjacent Turpentine Museum. 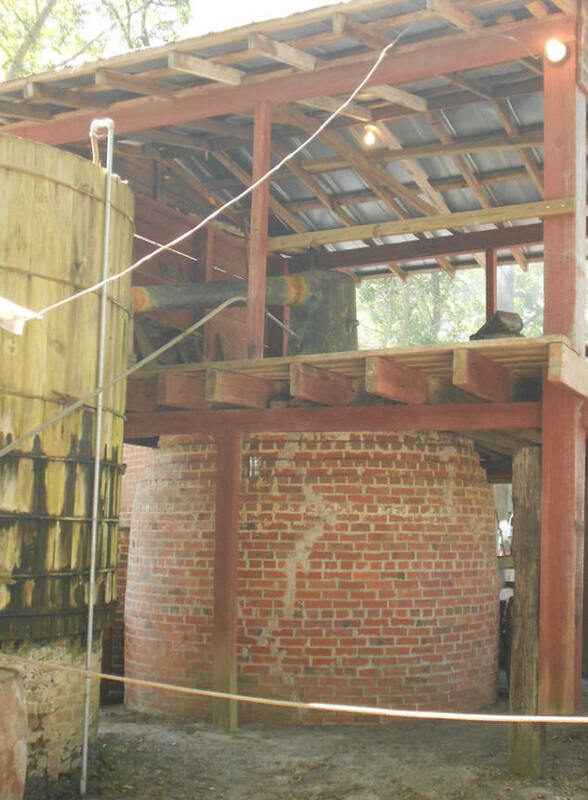 There are about three operating turpentine stills in the state; this is the only one on its original site. And during the festival it is truly operational. Turpentine comes out one end and rosin out the other. The master turpentiner will give a tour of the still if asked, but only to a couple at a time as the space is small and the still is actually operating. 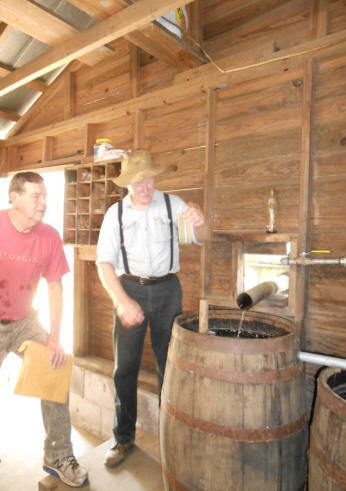 The turpentine coming from the still flows into a barrel in the museum. Rosin flows in the opposite direction late in the day at the end of the process. All the operational parts of the still are there, including displays of operating parts of the still and turpentine barrels. The museum has an assortment of turpentining tools and all sorts of related items, including displays of what a catface looks like. It’s a wonderful way to spend a day learning about southern culture, turpentine history and technology, listening to good music, and trying to avoid too much tempting food.